Compass Associates are thrilled to announce that our Business Support team have won Back-Office Support Team of the year at the IRP Awards 2018! The IRP Awards celebrate best practice of individuals and companies across the recruitment sector and this year marked the 10th anniversary of the awards. Director of HR & Communications, Kate Fairbrother and Head of Marketing & Communications, David Bland attended the glittering ceremony at the Lancaster Hotel in London. The team presently support 70 employees; 61 of which are billing consultants (as of October 2018) and have a combined length of service of 28.5 years! Our win is a result of the continued dedicated support to the Compass Holding Group brands across the whole team. 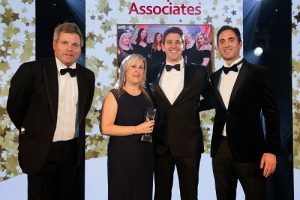 As well as managing all advertising, marketing, events and Web presence across Compass Associates and Compass Executives in the last year the team have launched a new a new brand: Compass Corporate Services (CCS – Compass’s HR, Finance & Accounting and Support Services recruitment branch) and won HealthInvestor’s Recruiter of the Year 2017! Congratulations to the team – what a fantastic achievement!